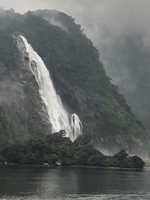 My sister and I have just returned from a very enjoyable 12 night cruise on the Norwegian Jewel sailing to New Zealand. We stayed at the Holiday Inn in Sydney, with lovely views of the harbour from the rooftop pool area, the night before sailing. The hotel was clean and comfortable and a 5 minute walk to the cruise terminal. Embarkation was quick and painless. Although the ship was full it never felt crowded, there were always seats available and quiet areas to relax in. The service from the stewards, waiters, bar staff and guest services was generally pleasant and attentive. I was very impressed by the lifeguards at the pool who were always diligent in supervising the pool area. There was a high standard of cleanliness throughout the ship and a large emphasis on hygiene (washy washy). For the MDR we preferred Tsars over Azura as the decor was much brighter. The food was generally good, obviously we found some dishes better than others but that could have been our taste. Everything was well cooked and the meals always came out hot. One of our favourite appetisers was the Mozzarella Ravioli. O&apos;Sheehans was okay for a quick breakfast or a snack. We used the dining package to go to the speciality restaurants with Le Bistro coming out on top with their beef fillet which melted in your mouth. Cagney&apos;s and Teppanyaki were good too. We were disappointed in Moderno as some of the meat was a bit tough and the service not up to the standard we expected. It might have been an off night as other people on the same cruise said Moderno&apos;s food and service was great when they went. We preferred not to eat at the buffet but it was well populated at meal times. Entertainment on board was excellent from the bands playing at the pool to the guitarist in the bar areas. The theatre shows that we went to were of an extremely high standard. The three production shows are not to be missed and the comedian Simon had us laughing continuously. 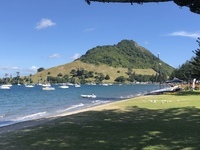 Our favourite ports were Tauranga where we walked around the base of Mt Maunganui, Napier where we did a wine and food tour with Frankly Tours (highly recommended) and Akaroa where we strolled around the bay and browsed through all the stores. The scenery of the Sounds was amazing, lots of photo opportunities. Disembarkation was easy and well organised with no long queues when we disembarked. Overall I would definitely sail with NCL again with a preference for the smaller NCL ships. My sister and I have just returned from a very enjoyable 12 night cruise on the Norwegian Jewel sailing to New Zealand. 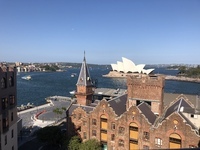 We stayed at the Holiday Inn in Sydney, with lovely views of the harbour from the rooftop pool area, the night before sailing. The hotel was clean and comfortable and a 5 minute walk to the cruise terminal. Embarkation was quick and painless. Although the ship was full it never felt crowded, there were always seats available and quiet areas to relax in. The service from the stewards, waiters, bar staff and guest services was generally pleasant and attentive. I was very impressed by the lifeguards at the pool who were always diligent in supervising the pool area. There was a high standard of cleanliness throughout the ship and a large emphasis on hygiene (washy washy). For the MDR we preferred Tsars over Azura as the decor was much brighter. The food was generally good, obviously we found some dishes better than others but that could have been our taste. Everything was well cooked and the meals always came out hot. One of our favourite appetisers was the Mozzarella Ravioli. O&apos;Sheehans was okay for a quick breakfast or a snack. We used the dining package to go to the speciality restaurants with Le Bistro coming out on top with their beef fillet which melted in your mouth. Cagney&apos;s and Teppanyaki were good too. We were disappointed in Moderno as some of the meat was a bit tough and the service not up to the standard we expected. It might have been an off night as other people on the same cruise said Moderno&apos;s food and service was great when they went. We preferred not to eat at the buffet but it was well populated at meal times. Entertainment on board was excellent from the bands playing at the pool to the guitarist in the bar areas. The theatre shows that we went to were of an extremely high standard. The three production shows are not to be missed and the comedian Simon had us laughing continuously. Our favourite ports were Tauranga where we walked around the base of Mt Maunganui, Napier where we did a wine and food tour with Frankly Tours (highly recommended) and Akaroa where we strolled around the bay and browsed through all the stores. 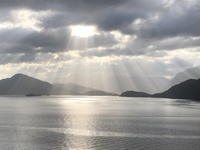 The scenery of the Sounds was amazing, lots of photo opportunities. Disembarkation was easy and well organised with no long queues when we disembarked. Overall I would definitely sail with NCL again with a preference for the smaller NCL ships. Very clean and well maintained. Plenty of storage space and at least 20 hangers in the wardrobe. A bit squishy when the bed is separated into two singles but still manageable. Generally very quiet, no noise from restaurants or bars, could hear people in the cabin above us occasionally but we put it down to noisy neighbours but it wasn&apos;t loud enough for us to be too disturbed by it. Lovely little tourist town nestled around a bay. Strolled along the bay and browsed through the shops. Typical of any city. It was an afternoon and evening port of call so did some sightseeing and returned back to ship. Strolled through town. Lots of nice cafes and restaurants. Small private tour visiting points of interest and wineries. Guide very knowledgeable and friendly. Lovely winery for lunch. Beautiful harbour to sail away from. Lovely town in a bay. Lots of tourist shops where we spent time browsing.